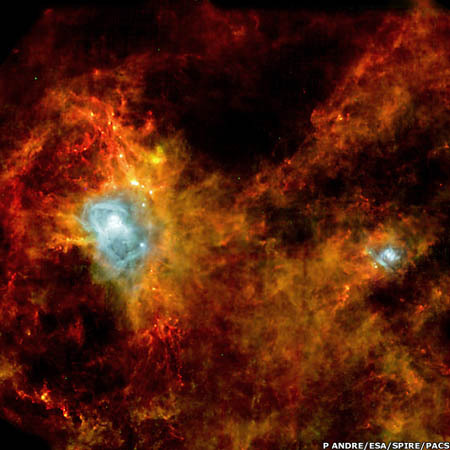 A star-forming region, 1,000 light-years away in Aquila. About 100 protostars have been found in this stellar nursery, together with 600 other objects that will eventually pass throught the protostar stage. Stars form within the densest parts of great gatherings of gas and dust known as molecular clouds. The first stage in the process of stellar birth involves the formation of a distinct clump within such a cloud. The clump becomes detached from its surroundings and begins to contract under its own gravitational pull. At the center of the collapsing cloud, where the density is greatest, a protostellar core forms. Over a period of about a million years this core draws in more and more material from its surroundings until it achieves the status of a protostar. After a further period, the protostar evolves to become a pre-main-sequence object such as a T Tauri star.